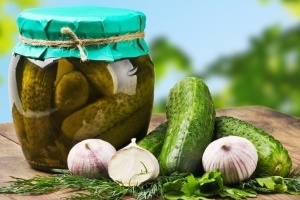 Fermented products - Agricultural complex "Zhdanovichi"
Since ancient times, people have been pickling foods, and no one meal is not complete without sauerkraut with sour cranberries, tomatoes and cucumbers. That is particularly so because even though the fermentation procedure is long and laborious, but it does not require any sophisticated technology. 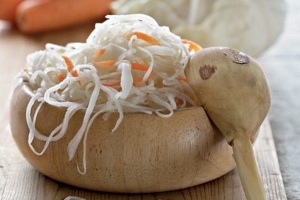 The process of fermentation can be called sanobrabotku products. In the old days thought that way. However, today it is known that the products quasada not spontaneously. Work to preserve their properties, taking on lactic acid bacteria. Feed them sugar contained in fruits and product of their decay is lactic acid. This acid when produced by a sufficient amount, and kills bacteria, putrefactive organisms that cause spoilage. And the main goal of fermentation is to provide the bacteria with favourable conditions for growth and development, so that the excess sugar was processed earlier than the activity of putrefactive microorganisms are activated. Fresh vegetables pickle them whole or ground (chopped cars, cut saccani), add table salt at the rate of approximately 2.5 kg per 100 kg of vegetables, tightly tamped in vats or barrels. Under the action of microbes (lactic acid bacteria) is in the process of fermentation (fermentation). Depending on the temperature of the pickling can take place from several days to several months. Pickled products are stored at a temperature of from 0 to 2 °C. Store pickled fruits and vegetables in the same container, and fermented. For this purpose, glaciers, warehouses, trenches with ice, basements and reservoirs. Of course, the pickled cabbage is one of the most popular ways of canning. Compared to salting and marinating, is the process longer, but the result is not only delicious, but also very useful, even a medical product. She is one of those products that contain the highest amount of vitamin C. our great-grandmothers widely used sauerkraut in folk medicine and home cosmetics. Being a perfect snack, it is used for cooking delicious dishes. Pickled apples – a dish which is prepared from apples by soaking with the addition of various spices. 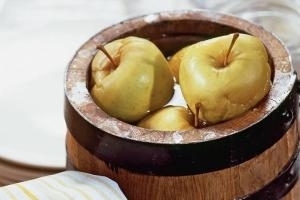 Pickled apples are one of the traditional dishes of Belarusian cuisine. To ret the most suitable apples late varieties. Watering the best apples in barrels or in pots, but it is possible and in glass containers. Tubs (preferably oak) prepare the same, as with the pickled cabbage. In traditional recipes you must shoot the bottom and sides of the scalded rye or wheat straw, which protects the apples from mechanical damage and improves their color and taste. Pour apples specially prepared malt (brine). Salted cucumbers – a dish that is prepared from cucumber by salting with the addition of various spices. Cucumbers for pickling are sorted by size, maturity and grade. More suitable for pickling are cucumbers with black pimples, cucumber with white – used in fresh form. A special delicacy is considered salty young cucumbers that have a thin skin and dense flesh without voids. Cooking is that cucumbers are placed in brine and aged in wooden barrels for several weeks to several months. In addition to the salt in the brine add the spices that vary from recipe: garlic, dill, black pepper, black currant, cherry, oak, horseradish, and others. 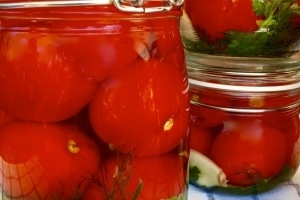 Pickled tomatoes are popular for quite a long time. Today one can not only cook yourself, but you can buy ready at the store. If You prefer the second option, it is necessary to pay attention to the recipe, so there was nothing superfluous and harmful. For pickling can be used not only ripe, but green fruit. In this case, the tomatoes almost does not contain sugar and different tart taste and low acidity.